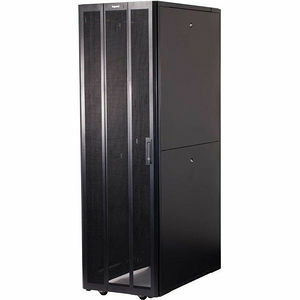 This Rack Enclosure Server Cabinet is an ideal solution for mounting networking and telecom equipment in a wide variety of applications from small IT installs to colocation datacenters. This cabinet ships completely assembled which speeds installation time. UL 2416 listed, it meets industry requirements for loading, bonding and safety. This cabinet supports up to a 3,000 lbs. static load capacity and is able to support almost any application. The adjustable 19in EIA mounting rails provide adjustments in 0.25in increments. This cabinet features vertical RU and front-to-back spacing indicators which simplify alignment for equipment mounting while the two-piece lockable side panels simplify panel handling and access to equipment.